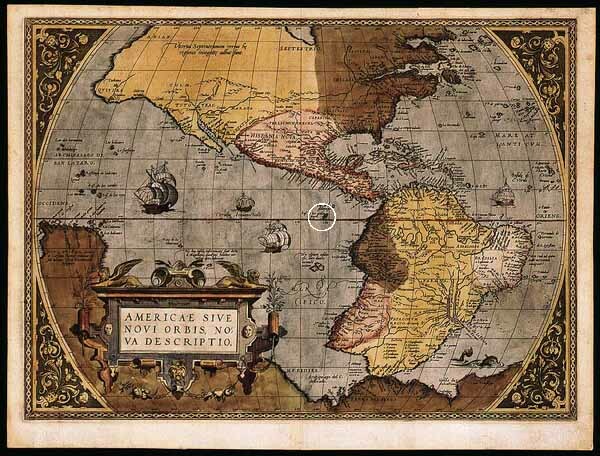 Ortelius' map of the Americas from the Orbis Terrarum shows the Galapagos Islands' approximate location (white circle): on the equator several hundred miles west of South America. Closer inspection of the islands (below) reveals significant inaccuracy, a reflection of relative ignorance about the islands themselves. 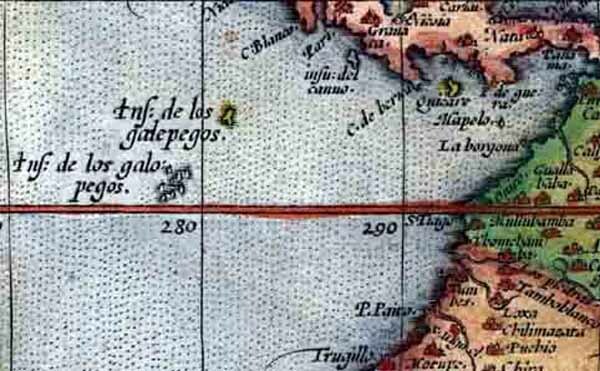 This detail from Ortelius' map shows that details of the islands (Insulae de los galopegos) were poorly known, although their location is approximately correct. The group seems composed of a half dozen similarly sized islands just above the equator. In fact there are thirteen major islands, and most of the land area is below the equator. Also, the colored feature to the northeast of the main group may represent one of the small northerly islands but the best candidate may be Cocos Island, which is not considered part of the archipelago. Later editions of the Orbis Terrarum corrected this error.